Thank you for visiting our website. This site was built to help provide you with resources for planning and designing your custom cabinetry. Please feel free to contact us with any questions or comments. We sincerely thank all our clients for helping us grow to be a company where we get to do what we enjoy and be part of your remodeling experience. 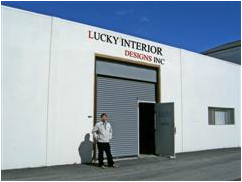 Lucky Interior Designs, Inc., DBA Lucky Cabinets began as a branch of Lucky Construction Co. We started out as a simple construction company and have been serving the Bay Area for over 30 years. We specialized in custom built homes and Kitchen and Bath remodels. During our time in construction, we observed our clients had to drive around the bay area to many places to look for finishing materials such as flooring, counter tops, and cabinetry because the industry was very specialized and costly. You other option was going to a warehouse store where everything is generic or of lesser quality. We offered our clients access to our contractor discount prices and whole sale discounts to help keep remodeling projects within budget, but still using high quality materials. As Lucky Interior Designs, we have access to accounts with all major plumbing, flooring, and finishing material suppliers to get the best value for our clients. In the process of providing great value, Lucky Cabinets was founded to offer our customers custom built cabinetry at a reasonable price. We wanted to provide an alternative option over-paying for “off the shelf” cabinets purchased at large warehouse home centers. We believed that we can provide better cabinetry built from real wood and offer competitive prices than the overpriced particle board cabinets found at Home remodeling centers. Our goal is to eliminate all the fluff and offer a quality product so that every dollar spent goes back to ensuring you are getting a high quality product. With the great support of contractors, architect, designers and referral from clients like yourself, we eliminated the need for advertisements and in turn pass our savings back to you.